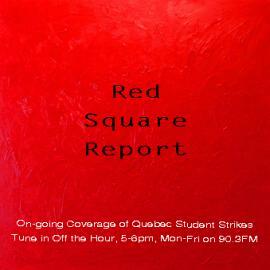 CKUT’s Off the Hour: Red Square Report on Friday, April 20th is particularly worth listening to. Listen to CKUT’s Stéfanie Clermont’s on the ground coverage of the “Occupation du palais des congres en opposition au plan nord.” Find the audio here. Visit Stéfanie Clermont’s Montreal Media Co-op page for more of her reporting on the Quebec Student Strike.